I'd like a complete set of Bonanza figures with a Hop Sing exclusive. 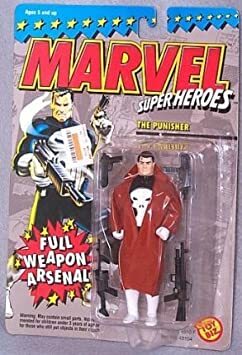 How about a decent Punisher figure? Here you go: Mezco's new Punisher figure just went up for pre-order yesterday. It's definitely pricey, but One:12 figures are worth it, in my opinion. They will also be coming out with a few more versions of the Punisher (you can see a few of them here. ), including a classic one that was seen at Toy Fair (link here). I want a line in the 12 inch GI Joe scale for Jonny Quest complete with all kinds of vehicles and playset accessories. Benton Quest is a spitting image double for a ginger bearded GI Joe and Race could be one of the clean-shaven Joes with white hair. Jonny and Haji would have to be in the 10 inch tall range. A Jade figure is a must too. Villains (like say Frogmen and Yeti, a SPider-drone vehicle, some jeeps and planes for the Quest crew...it would be awesome. Well I might sort of get my wish, I found out Figures Toy Company (the ones who produced the Conan. Kull & Solomon Kane figures I got this weekend) are doing a retro-Mego style set of Hanna BArbera figures and Jonny Quest will be among those produced, say the prototypes for Dr. Quest, Rqace, Jonny and Hadji. It's 8 inch Mego scale, not 12 inch GI Joe and no accessories or playsets, but it's a start. Other Hanna Barbera characters are set to follow (I think Space Ghost with the twins is on deck). Not sure what the intended release date is though, but they were announced back in April on the Figures Toyline facebook page. Nothing is listed on their website though for release date or upcoming products. It also occurred to my wife and I last night how weird it is that Funko hasn't done a Retro Action set on any of those '80s children's fantasy films that never ended up getting toy lines. Dark Crystal came close, but still no cigar. Of course it would only be a dream line combining any/all versions in 6 inch form of western hero/villains. Just think: Lone Ranger and Tonto, Zorro along side the likes of Jonah Hex, Bat Lash, Two-Gun Kid, Kid Colt, Rawhide Kid, Red Wolf, Night Rider and could include classics like Roy Rogers, Gene Autry, Tom Mix and such. We need to get a direct hotline to Funko fast. This is a brilliant idea. This was the first wave and is out. A Second wave is in the planning stages from what I understand, and they are still deciding which 4 characters are to be in Wave 2. If Wave 2 is successful, there could be a third, that seems to be the way Figures Toy Company Works. They do a lot of different things, but they only produce a set number of each because the market is small but steady for the retro-Mego revival. And I'm also afraid we'll run into the same problem we've seen with every figure line that's ever had a wave of Titans figures -- they never do them all. Will we get a classic Beast Boy, Jericho, Terra, a teen-aged Robin? I know the company is waiting to see if I'll buy these guys before making more, but I'm waiting to see if they'll make more before buying these guys. The head sculpts on those are pretty darn ugly. Well that's the vicious circle. The customer base for these things doesn't support more than 5-10K units produced for the most in-demand of it, and far less for the obscure/secodary/tertiary characters, so it's hard to get the factories in China to agree to run the productions as they have much larger, more profitable runs they can do, and they fit these small runs into gaps or lulls in the production schedules, so producers have to keep the waves small or they take forever to produce them, but the sales of one wave is what funds the production of the next wave. These aren't large corporations with unlimited funding to do lines-those companies won;t touch a line like the New Teen Titans in classic form because the demand is so insignificant compared to what they can produce on other lines it's not worth their time and effort. If they do anything Titans related, it would be based on Teen Titans Go not the classic look. When you get a classic line the other issue is that the base where demand is is divided. Some, want the retro stuff to look like the vintage stuff, others want it to have the production quality of stuff like the Sideshow stuff. Sideshow can do some more obscure figures because they have people who buy their brand regardless of the figure, but they are never going to do a whole classic line. The other half of the vicious circle is that when Titans lines have been done, the more popular characters haven't sold well enough to justify continuing the line with the more obscure characters and the more obscure characters won't sell enough to justify a line of figures without sales on the more popular propping up the line. So small companies who would do the obscure characters can't if you don't buy the more popular ones first to fund those later waves, and big companies who could afford to produce the whole set at once won't because the line as a whole and the obscure characters in particular, aren't worth their time and effort to do because their is such a tiny fragmented market that would buy them. The only hope for the obscure characters is if a smaller company does well enough with the initial wave to greenlight a second wave, but if those who might buy them are waiting to see if there is a second wave before buying, there will never be a second wave. It's pretty much a situation where you have to vote with your dollars if you want to see lines continue because the big dogs would rather do the umpteenth variation of Batman or Deadpool than the first Jericho or some such. 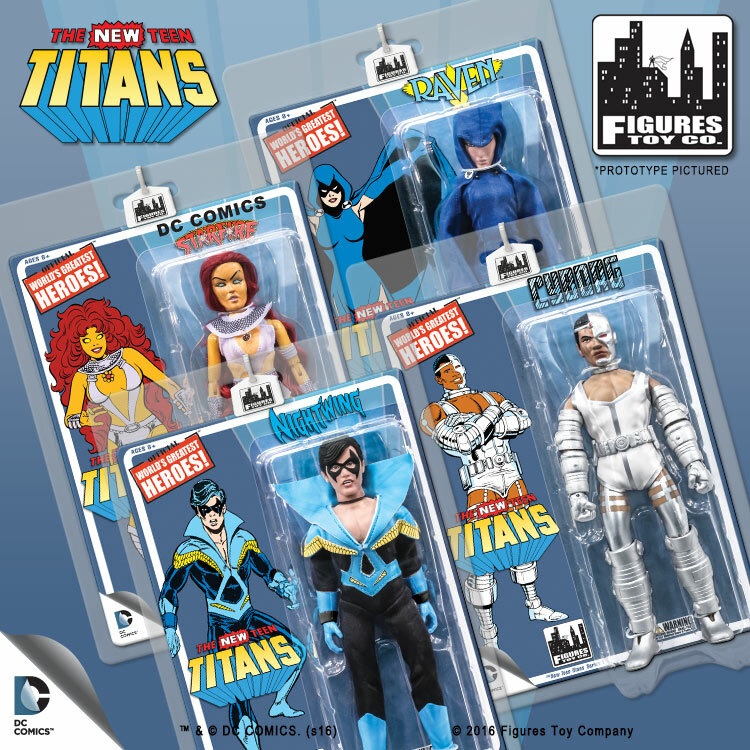 As for Titans in particular, I think most of the line has been produced by DC Direct in some form or other with a few gaps, but not all part of the same series with the same packaging. The scale would be the same, but the eras off. Anything mass market from DC/Mattel now though is going to be new52/Rebirth era looks not classic though, and anything retro is limited to smaller collector based series that have to be diverse (not theme specific) to cast as wide a net for potential buyers as possible. Also, it is easier for smaller companies to do retro Mego figures than the 3 3/4 or DC Direct/Marvel Legends scale because the Mego style only needs 2-3 total body sculpts (male, female, larger frame i.e. Hulk body) with the heads being the primary expense. Smaller scale susually require every body to be it's own sculpt which raises production costs not only because each has to be sculpted, but the machines have to then run each body on its own in snaller numbers than the whole of the line. I know some collector's will say, I want what I want, but the economic reality is that it is next to impossible for some of these to happen without someone losing their shirt. If you want what you want and it's not enough to carry an actual product line, you better start looking at custom kitbashing or investing in a 3-D printer, the artistic/technical skills to design what you want the way you want, and make your own. The smaller companies are making ends meet, but that's it, and the bigger companies only want what will turn a minimum acceptable revenue stream to not only justify production costs but make enough to beef up quarterly reports for stockholders. So you are likely going to be waiting a long, long time for a complete set of Titans to be available all at once if you don't buy it as the waves are released, unless you make your own. While I have an understanding and appreciation for the market, I'm also not going to buy what I don't want. I don't want an ugly looking set, and I don't want an incomplete set. Beyond that, I'm pretty flexible. 3.75", 6", 8", I don't care -- super poseable, retro Funko style, Mego style, I don't care. Sell me a complete set of classic Titans, all at one time, that looks decent. I'll shell out the bucks. And I still think they should just do these as a giftset. That way, they don't have to worry whether folks will buy some but not all, and I won't have to worry if they'll release some but not all.